Multizone Control System - TC Ltd.
﻿The SR Mini System comprises a Power Supply and Central Processor Model (PCP Module), each of which can support up to ten Control, Alarm or Monitoring Modules (System Module). Seamless expansion is then achieved simply by the addition of further PCP Modules and associated System Modules. ﻿The SR Mini System can be simply connected to a number of devices as shown. We offer a simple to use, very low cost, auto configuring Windows® based supervisory programme (SCADA) suitable for even the smallest application. The SR Mini is an ideal solution for your factory automation, data acquisition and analysis requirements. ﻿﻿﻿When used with a PLC, the SR Mini continuously processes the input signals from your sensors and performs fast PID control. This allows the PLC to be used more efficiently for sequence and timing functions, which in turn increases the processing speed of the PLC. ﻿﻿A PLC based temperature control system can be developed without the need for special communication software. Using MapmanTM a range of industrial PLCs is available for simple connection. ﻿Constantly updated parameter settings are stored in the PCP module for immediate transmission to connected devices as desired. ﻿A choice of system connection modules is available for flexible system expansion. The PCP module is supplied as standard with one communication port. A module is available which has dual communication ports allowing access to the system from two external devices. 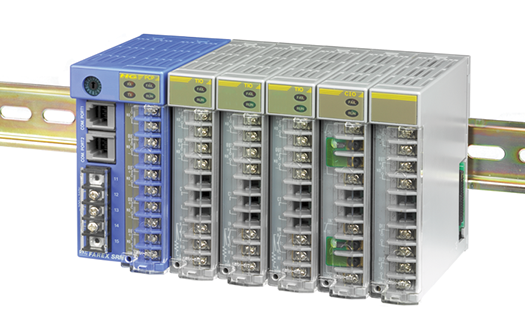 ﻿A range of proprietary converters, PCP and link modules enable the SR Mini system to communicate with Ethernet, Modbus, Profibus, Devicenet, and Mitsubishi “cc” link field network systems. ﻿﻿﻿Using the versatile 'mother block' mounting system, all modules can be quickly fitted to a DIN rail assembly. The time required to pierce control panels, fit and wire to individual controllers is substantially reduced. ﻿Powerful low profile modules that measure only 96 x 24 x 100mm allow an effective solution, whether designing new or retro fitting existing control panels..
Due to the complex nature of Multizone Control Systems, please outline your application in the space below and one of our experienced engineers will contact you to discuss your specific application. Alternatively, please email us with your requirements.